evolution, development, homology, and phylogeny. The Neopterygii are the largest and most important group of fishes, and they also include the teleosts and, thus, some 50 % of modern vertebrate biodiversity. However, the origin and early evolution of neopterygians is still poorly understood, as are the interrelationships of their main lineages. This situation is mainly due to two interrelated factors, the unresolved question of the outgroup to Neopterygii, and many problematic homologies within basal neopterygians. The objectives of this project are thus a clarification of primary hypotheses of homologies in basal neopterygians and their testing in a large-scale phylogenetic analysis, thus clarifying the interrelationships of the major lineages of the Neopterygii. This broad project includes several studies that independently contribute to understand the evolution of the anatomical structures in basal neopterygians. Among them, the phylogenetic analysis of the family †Coccolepididae was aimed to improve the curret knowledge of the Chondrostei, which is the living sistergroup of Neopterygii. The detailed anatomical study of the species of †Aspidorhynchus (†Aspidorhynchidae, Tleosteomorpha) led to very important results: a thorough taxonomic revision of these fishes with the revalidation of one nominal species, and the recognition of several anatomical features that were previously unknown for this group of fishes. In addition, several neopterygian taxa of uncertain phylogenetic relationships are currently under study. Many of these taxa are represented by exceptionally well-preserved specimens! Therefore, the detailed anatomical study of these materials not only allows clarifying their sistematic position, but more importantly, it enormously helps reconstructing the phylogenetic relationships of the basal neopterygean lineages through claryfing homologies and character evolution within this major group of fishes. Diversity and Evolution of Semionotid Fishes. With more than 27000 species, including almost all living ray-finned fishes, the Neopterygii is the largest clade of Recent vertebrates. However, its early history and the phylogenetic relationships among basal neopterygians, and thus the origin of the teleosts, are still poorly understood. One of the most important and controversial groups of basal neopterygians has been the so-called “semionotids”. 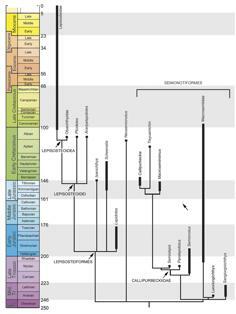 Although “semionotids” are among the most common basal neopterygians in Mesozoic sediments, and some of them were among the first fossil fishes to be described, their phylogenetic relationships and even their alpha taxonomy were very problematic at the time this project began. Therefore, this project was aimed to solve the taxonomy of the main “semionotid” taxa, to explore the phylogenetic relationships of these fishes and to define a monophyletic Semionotiformes. With these objectives, five new species (†Scheenstia zappi, †Tlayuamichin itzli, †Sangiorgioichthys sui, †Lepidoites pankowskii, and †Macrosemimimus fegerti) and three new genera (†Scheenstia, †Macrosemimimus, and †Callipurbeckia) were established. The monophyly of the most common “semionotid” genera †Semionotus and †Lepidotes was established and the two taxa were redefined. The phylogenetic relationships between these and other "semionotiform" genera, five genera of gars and three macrosemiid genera were analysed through a cladistic analysis, based on 90 morphological characters and 37 taxa. The results of the analysis showed that the “semionotiforms”, the gars and the macrosemiids form a monophylgetic clade, the Ginglymodi, which includes two main lineages: the Lepisosteiformes and the †Semionotiformes. The genera †Pliodetes, †Araripelepidotes, †Lepidotes, †Scheenstia, and †Isanichthys are lepisosteiforms, and not semionotiforms, as previously thought. Thus, these taxa extend the stratigraphic range of the lineage leading to the gars by c. 70 Ma reaching back up to the Early Jurassic. A monophyletic †Lepidotes is restricted to the Early Jurassic species, whereas the strongly tritoral species previously referred to †Lepidotes are referred to †Scheenstia. Other species previously referred to †Lepidotes represent other genera or new taxa. The macrosemiids are well nested within semionotiforms, together with a monophyletic †Semionotidae restricted to the genus †Semionotus, and a new family including †Callipurbeckia, †Macrosemimimus, †Tlayuamichin, †Paralepidotus, and †Semiolepis. To summarize, at the time when the project was applied for, the “semionotids”, were considered monophyletic when including †Semionotus and †Lepidotes only, but the monophyly of the group was doubtful if the other “semionotiform” genera were considered. Also, the systematic position of these fishes within the Neopterygii was uncertain. The situation after the project is radically different: †Semionotus and †Lepidotes are not sister groups, but belong to different lineages, and the †Semionotiformes, excluding thus †Lepidotes and other “semionotiform” genera, and including the macrosemiids, are one of the two lineages of the major neopterygian clade Ginglymodi. The other ginglymodian lineage is the Lepisosteiformes, which includes †Lepidotes and †Scheenstia, †Isanichthys, †Pliodetes, and †Araripelepidotes, the other genera excluded from the monophyletic †Semionotiformes. Also, the project resulted in the clarification of the taxonomic status of †Lepidotes, which had been a "wastebasket" taxon for “semionotid”-like fishes. Thus, a countless number of fossils from Early Jurassic to latest Cretaceous rocks have been referred to this genus, spanning about 130 million years. The project led to the definition of a monophyletic †Lepidotes, which is restricted to several Early Jurassic species from central Europe. Other well-known species previously referred to †Lepidotes are now referred to †Scheenstia or †Callipurbeckia. Several questions are still open, such as the taxonomoy of numerous Triassic species referred to †Semionotus or the possible monophyly of the family †Lepidotidae including †Lepidotes and †Scheenstia, but this project produced the necessary phylogenetic framework to explore and solve this pending issues in the future. Not only that, the project lead to a much better understanding of the Lepisosteiformes and the Ginglymodi as a whole, which now allows a broader analysis to explore the systematic position of the Ginglymodi among neopterygians. The study of Mesozoic ginglymodians led to confirm Patterson’s observation that these fishes show morphological affinities with both halecomorphs and teleosts. Therefore, further studies on Mesozoic ginglymodians are essential to test the hypotheses of the Halecostomi vs. the Holostei, which is one of the major topics in the evolution of Mesozoic vertebrates and the origin of modern fish faunas at the moment. López-Arbarello, A., Sferco, E. and Rauhut, O.W.M. 2013. A new genus of coccolepidid fishes (Actinopterygii, Chondrostei) from the continental Jurassic of Patagonia. Palaeontologia electronica 16(1): 7A 23p. López-Arbarello, A., Sferco, E. 2011. 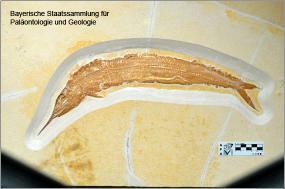 New semionotiform (Actinopterygii: Neopterygii) from the Late Jurassic of southern Germany. Journal of Systematic Palaeontology 9(2): 197-215. López-Arbarello, A., Sun, Z.-Y., Sferco, E., Tintori, A., Xu, G.-H., Sun, Y.-L., Wu, F.X., Jiang, D.-Y. 2011. New species of Sangiorgioichthys Tintori and Lombardo, 2007 (Neopterygii, Semionotiformes) from the Anisian of Luoping (Yunnan Province, South China). Zootaxa 2749: 25-39. López-Arbarello, A., Alvarado-Ortega, J. 2011. New semionotiform (Neopterygii) from the Tlaya Quarry (Early Cretaceous, Albian), Mexico. Zootaxa 2749: 1-24. Forey, P.L., López-Arbarello, A., MacLeod, N. 2011. A new specis of Lepidotes (Actinopterygii: Semionotiformes) from the Cenomanian (Upper Cretaceous) of Morocco. Palaeontologia electronica 14(1): 1-12. López-Arbarello, A., Rauhut, O.W.M., Cerdeño, E. 2010. The Triassic fish fauna of the Cuyana Basin, Western Argentina. Palaeontology 53(2): 249-276. López-Arbarello, A. 2008. Revision of Semionotus bergeri Agassiz, 1833 (Upper Triassic, Germany), with comments on the taxonomic status of Semionotus (Actinopterygii, Semionotiformes). Palaeontologische Zeitschrift 82(1): 40-54. López-Arbarello, A., L. Codorniú 2007. Semionotids (Neopterygii, Semionotiformes) from the Lower Cretaceous Lagarcito Formation, San Luis Province, Argentina. Journal of Vertebrate Paleontology 27(4): 811-826.